It is always a pleasure to try a brand new technology on the Mac. There is something satisfying that comes with using a computer or gadget in a way that you have never experienced before, and the pace of technological development is such that there is always some new feature or bauble on the latest hardware or software to play with and coo over. Most often, this is something fancy and new that Apple has built in to their products, but in this case it is a Blu-ray writer from Other World Computing that is under consideration. Blu-ray is the spiritual successor to DVD, and has in fact vanquished the HD-DVD, the true extension to the DVD standard. It is designed to offer full HD movie playback on disc the same size as a regular DVD, and does this by using a blue wavelength laser to read data marks on the disk that are much smaller and packed much closer together than on a DVD. The blue laser gives the format its name, and the closer-packed data marks mean that a typical Blu-ray disc can hold 25Gb of data on a single-layer disc – a little more than five times the capacity of a single layer DVD. Blu-ray was developed by Sony, and is managed by an industry consortium of hardware, software and content producers. Apple is not a member of this group (they backed HD-DVD originally) and Steve Jobs famously declared the licensing of Blu-ray technology as a “bag of hurt”, and so, despite Blu-ray being widely available in Sony consoles and a myriad of ever-cheaper dedicated hardware players, the drives are not offered on any of the Macintosh line by Apple, and support for the technology is not available directly with Mac OS X.There are rumors that this is due to change, with the next round of iMac and Mac Pro updates being touted as the debut for Blu-Ray hardware support. Other World Computing has your back, though, if you are not particularly inclined to wait for Apple to join the high definition revolution, with the Mercury Pro enclosure loaded for bear with a Blu-ray burner. Let’s get one thing clear up front, though – without direct support for Blu-ray within OS X, you cannot watch Blu-ray movies with this drive, you will need a dedicated Blu-ray player or a Sony Playstation 3 for that. What it does offer is access to up to 50Gb of data storage on an optical disk, and the ability to burn your own movies in Blu-ray format. To do all of this you will have to use Toast Titanium from Roxio, which had the required Blu-ray support – OWC can sell you the drive with that software bundled if you don’t already own it. This illustrates the comprehensive approach that OWC takes to the complete customer experience. The hardware itself underlines this – the Mercury Pro enclosure is as solidly constructed as any unit from a dedicated storage manufacturer. Every single connectivity option is catered for – Firewire in both the 800 and 400 flavors, USB 2.0 and even eSATA for the pro users, and OWC even provide cables for all of the connectors except for the eSATA port, and a pair of 25Gb Blu-ray disks. 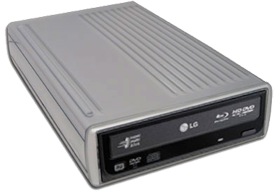 The drive I tested was fitted with an LG 8x Blu-ray drive (though OWC also have a Pioneer 8x option) that can cope with dual layer Blu-ray disks, DVDs and CDs of all types. To access the drive as a DVD burner or lower, you can use the built-in burning features of OS X, though as previously mentioned you will need Toast on order to write to Blu-ray media. Performance is good, though naturally the large data capacity of Blu-ray means that moving large volumes will take a while – I burned 25Gb of data to a Blu-ray disk in around 30 minutes, though this will vary depending on what type of media you use. Having used the drive for a while, I came to really value the ability to archive such a large amount of data to a single optical disk. Despite the prolific availability of terabytes of hard drive space at bargain basement prices, there is something tremendously simple about putting data onto an disk that can be labelled and left on a shelf. Data volumes are such that this is increasingly difficult to do with DVD – even at 8.5Gb for a dual layer DVD disk music or photo collections will typically require multiple DVDs. The only real downsides of this drive unit are matters currently outside of OWC’s control – blank Blu-ray media are still individually expensive, many times more so than DVD blanks. The reliance on third-party software support for Blu-ray burning is also not ideal. These factors need to be weighed up by any potential purchaser of the Mercury Pro Blu-ray burner – but if you think you need access to Blu-ray technology on the Mac today, I do not think you will be disappointed with the OWC offering.